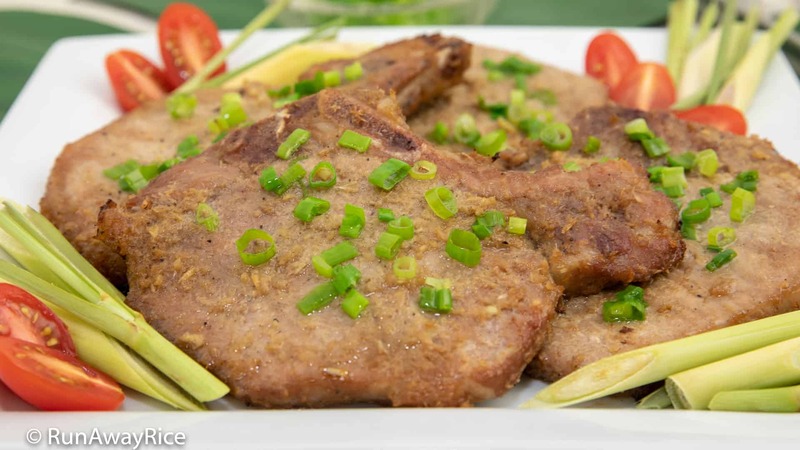 Make juicy and flavorful Grilled Lemongrass Pork Chops (Suon Nuong Xa) with this easy recipe. Marinated with a simple homemade sauce, these lemongrass infused pork chops are fragrant, savory and delicately sweet. Lemongrass adds amazing freshness and flavor to pork chops. The homemade marinade is really easy to make with just a few fresh ingredients and pantry staples. If you’re looking for a flavorful dish to enjoy at summer barbecues and beach trips, this is the recipe to try. Prepare the ingredients and marinate the pork ahead. The longer the pork chops marinate, the better the flavor. Grill up when ready. Enjoy this recipe for Grilled Lemongrass Pork Chops! The marinade recipe is really simple and versatile. Double or triple the marinade ingredients depending on how much pork you’re making. Don’t skip the lemongrass–it’s key! The lemongrass adds amazing fragrance and flavor to the pork chops. Use fresh, frozen or lemongrass paste. The marinade is a combination of sweet and savory but you can certainly making it sweeter or more savory depending on your preference. I use a 1:1 ratio of sweet (honey) to salty (soy sauce + fish sauce). I often make extra marinade to serve as a dipping sauce for the pork chops. If marinating the pork overnight, remove from the fridge and let rest at room temperature for 30 minutes before grilling. It’s always best to grill meats when it’s not cold for even cooking. The pork chops I am using are thin-cut and about 1/2 inch thick. I grill the pork chops to an internal temperature of 155 F (68 C). The National Pork Board recommends cooking pork chops to an internal temperature of 145 F (63 C). To eliminate any guesswork whether the meat is properly cooked, I use a digital thermometer. I love the Weber iGrill which has a cooking app to monitor the temperature and set timers and alarms. So geeky but I love it! 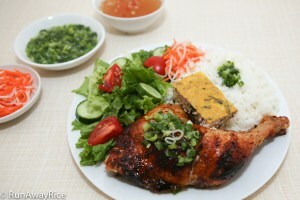 Make a classic Vietnamese rice plate by serving the Grilled Lemongrass Pork Chops with broken rice, Egg Meatloaf (Cha Trung), Scallion Oil (Mo Hanh), cucumber and tomato salad, Carrot and Radish Pickles (Do Chua) and Fish Sauce Dipping Sauce (Nuoc Mam Cham). It’s so delicious and one of my favorite combinations! Transfer the pork chops to a medium baking sheet or large plate. On each side of meat, sprinkle 1/2 Tbsp salt and drizzle 1/2 Tbsp white vinegar. Gently rub the mixture onto the pork. Rinse each pork chop under cold running water. Pat the meat dry using paper towels. Transfer the pork to a large dish. Cut off a section of lemongrass approximately 6-7 inches in length. Coarsely chop the lemongrass. Cut the peeled shallot into chunks. Cut the peeled garlic cloves in half. Transfer the shallots, garlic and lemongrass into a small food processor. Pulse for a few seconds until minced. Add the soy sauce, fish sauce, 1 Tbsp honey, sesame oil and ground black pepper into the food processor. Pulse the marinade ingredients until well combined. Coat both sides of the pork chops with the marinade and rub onto the meat. Let the pork chops marinate for at least 1 hour. For the best flavor, marinate overnight in the refrigerator. Heat the grill making sure it’s hot. Transfer the pork chops onto the grill and cook until they reach an internal temperature of 145 F (63 C), approximately 5-6 minutes per side. Brush the remaining 1 Tbsp honey on the cooked pork chops. Remove from the grill and let rest for 5 minutes. Top the Grilled Lemongrass Pork Chops with scallion oil. Refrigerate any remaining portions for 3-4 days. Freeze for up to 2 months. 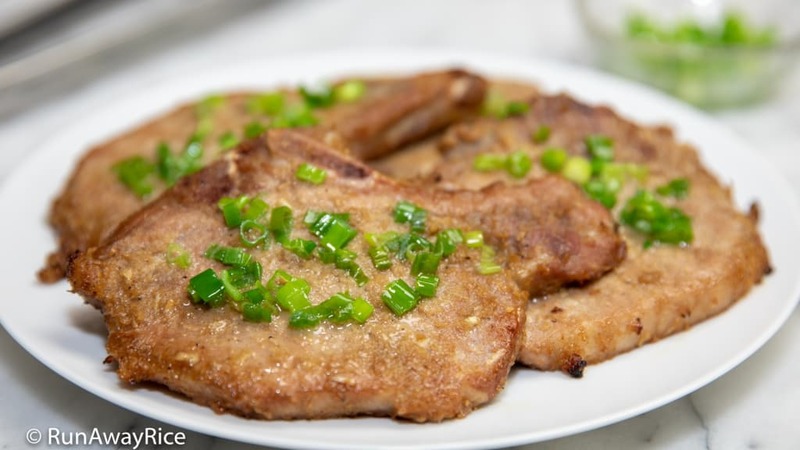 Make juicy and flavorful Grilled Lemongrass Pork Chops (Suon Nuong Xa) with this easy recipe. Marinated with a simple homemade sauce, these lemongrass infused pork chops are fragrant, savory and delicately sweet. 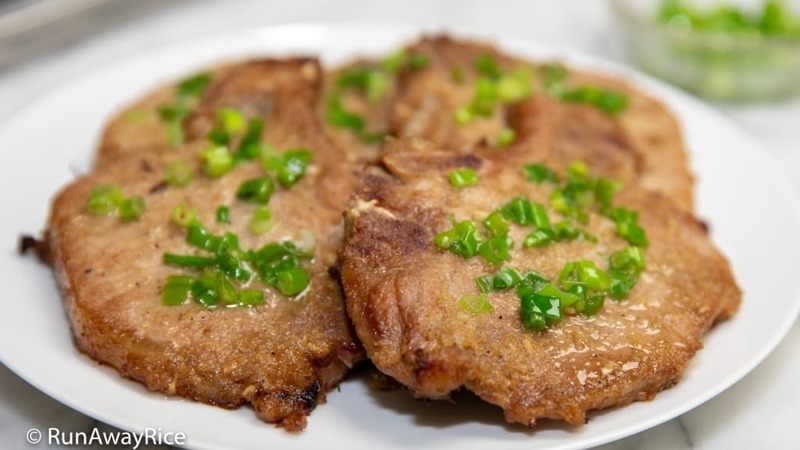 Lemongrass adds amazing freshness and flavor to pork chops. The homemade marinade is really easy to make with just a few fresh ingredients and pantry staples. If you're looking for a flavorful dish to enjoy at summer barbecues and cook-outs, this is the recipe to try! Heat the grill making sure it's hot. Transfer the pork chops onto the grill and cook until they reach an internal temperature of 145 F (63 C), approximately 5-6 minutes per side. The marinade recipe is really simple and versatile. Double or triple the marinade ingredients depending on how much pork you're making. Don't skip the lemongrass--it's key! The lemongrass adds amazing fragrance and flavor to the pork chops. 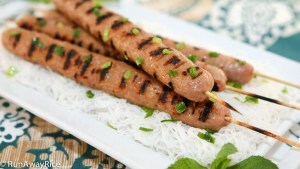 Use fresh, frozen or lemongrass paste. The marinade is a combination of sweet and savory but you can certainly making it sweeter or more savory depending on your preference. I use a 1:1 ratio of sweet (honey) to salty (soy sauce + fish sauce). I often make extra marinade to serve as a dipping sauce for the pork chops. If marinating the pork overnight, remove from the fridge and let rest at room temperature for 30 minutes before grilling. It's always best to grill meats when it's not cold for even cooking. The pork chops I have are thin-cut and about 1/2 inch thick. I grill the pork chops to an internal temperature of 155 F (68 C). The National Pork Board recommends cooking pork chops to an internal temperature of 145 F (63 C). To eliminate any guesswork whether the meat is properly cooked, I use a digital thermometer. I love the Weber iGrill which has a cooking app to monitor the temperature and set timers and alarms. So geeky but I love it! 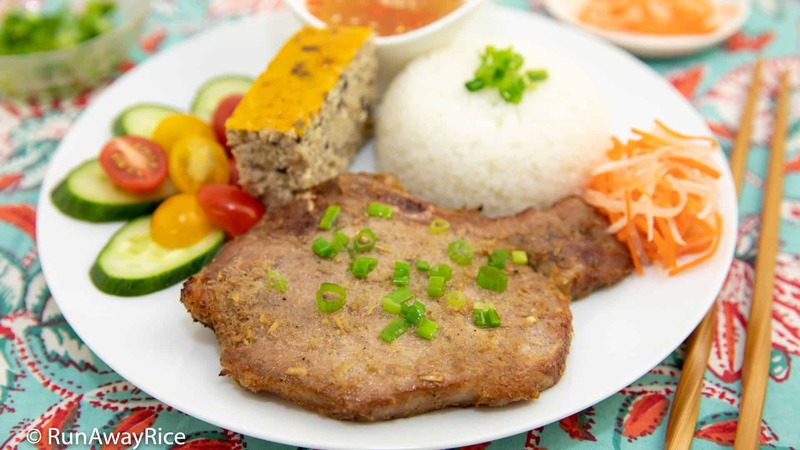 Make a classic Vietnamese rice plate by serving the Grilled Lemongrass Pork Chops with broken rice, Egg Meatloaf (Cha Trung), Scallion Oil (Mo Hanh), cucumber and tomato salad, Carrot and Radish Pickles (Do Chua) and Fish Sauce Dipping Sauce (Nuoc Mam Cham). It's so delicious and one of my favorite combinations! Hi Trang, I made these tonight with the scallion oil and fish sauce. Wow, just like when I have them at Vietnamese restaurants or at my parents’ house. They were a smash. Thanks for your recipes!!! Hey sis, your grilled lemongrass pork chops recipe was a hit at our church cook-out today. Perfectly seasoned and I love the lemongrass. Glazing the meat with honey at the end is brilliant. It made the pork chops glossy and adds a touch of sweet. 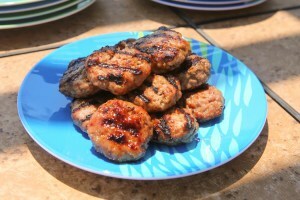 I am making these again for our July 4th barbecue. Thanks for sharing this yummy recipe! That’s wonderful! I am so glad to hear you enjoyed the recipe. I appreciate you stopping by to share your comments. Have an awesome July 4th!